Each of our specialty courses focuses on you having the proper knowledge, skills, equipment and experience required to help you become a more proficient diver. Taking a specific number of specialties and continuing your pursuit of dives allows you to earn higher levels of diver ratings. Most of our specialty classes are taught on an as needed basis. Come into the shop, sign up for the class you want, and we will get you paired up with an instructor who is available to teach it. YOU can customize your experience by deciding what classes are included in your journey to Specialty, Advanced or Master Diver. 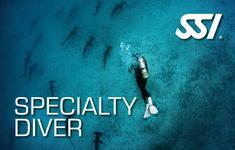 Want to be a Specialty Diver? Want to go Advanced Diver? Want to make Master Diver?